The minions from Despicable Me are some great characters! They are getting their own movie in 2015 so I decided to create a pattern so that I could wear them on my head! I also have a few friends that this would make a great gift! 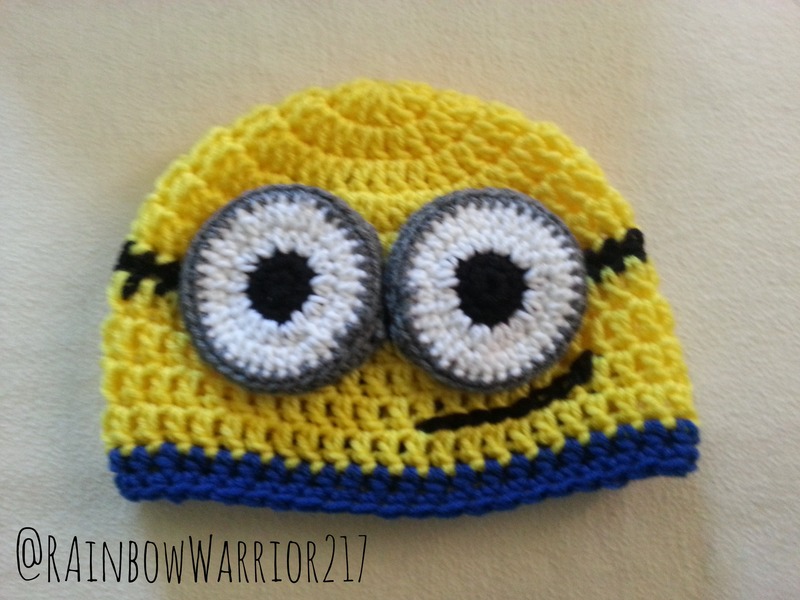 I used my seamless crochet beanie for this pattern. We are changing colors so you can stick to a method that you are comfortable with. 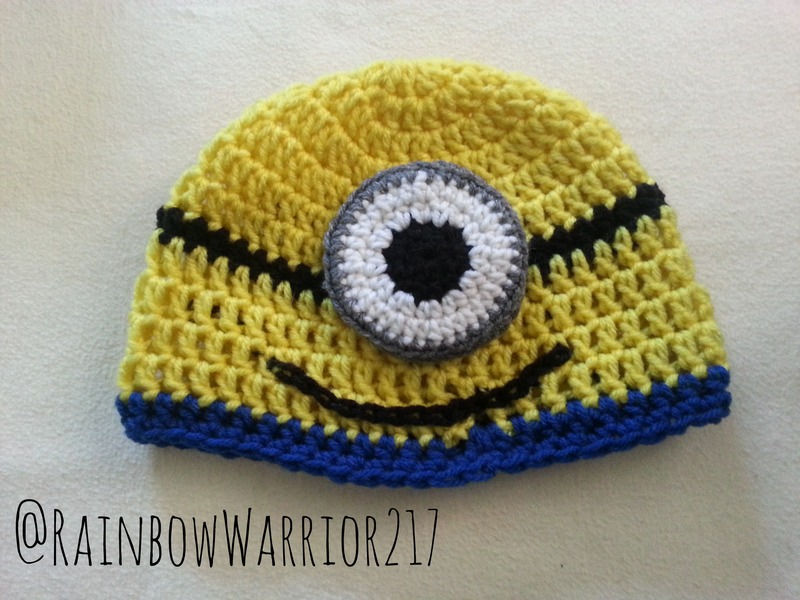 This patterns fits adult size, however, if you wanted to make childs size just be sure to use a beanie pattern that you know will fit your wanted dimensions. Begin with a magic loop & ch 1 to secure. Place stitch marker to keep track of your last stitch. When you reach the end of Round 6 sl st to join. Cut & pull through yarn. Round 7: Ch 1 to secure & hdc in ea st. sl st to join. Cut & pull through yarn. Switch back to yellow yarn. Round 8: Ch 1 to secure & dc in ea st. sl st to join. When you reach the end of Round 11 sl st to join. Cut & pull through yarn. Round 13: sc in ea st & sl st to join. Cut yarn & pull through. Sew in ends. Begin with Magic Loop & ch 1 to secure. Round 1: 8 sc in magic loop, sl st to join. Round 2: *2 sc in first st, 1 sc in next st* sl st to join. Cut yarn & pull through. Round 3: ch 1 to secure & 2 hdc in ea st. sl st to join. Round 4: *2 hdc in firs st, 1 hdc in next st* sl st to join. Cut yarn & pull through. Round 5: ch 1 to secure & sc in ea st. sl st to join. Round 6: sc in the back loop only. sl st to join. Cut medium-length tail & using tapestry needle sew your eyeball to your hat. *optional: make a second eyeball the exact same way! Use black yarn & chain embroidery stitch to create smile. Sew in all your ends & your beanie is complete! Pattern Notes: This pattern is easily adjustable. This hat fits standard adult size. When making my character hats I always use my Seamless Basic Beanie Crochet Pattern because it is simple & easy and I like the look of it. I know many adults who would love this hat! 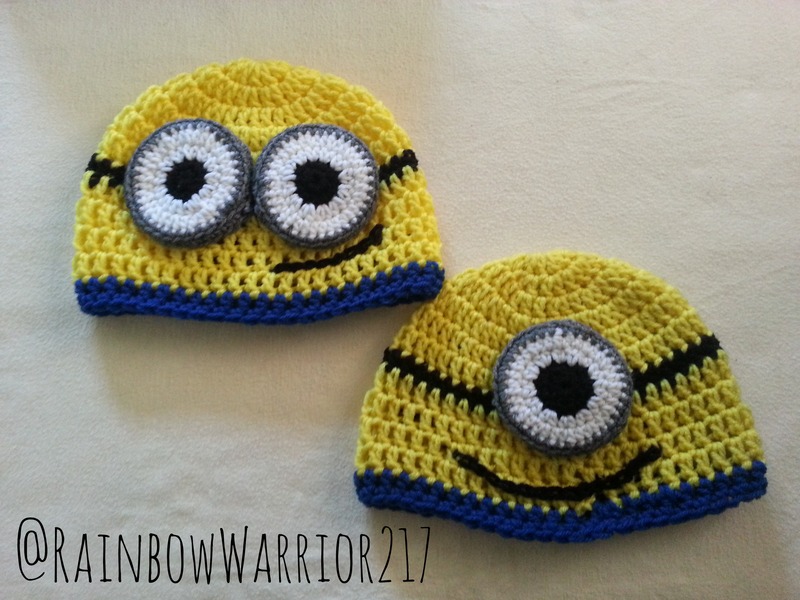 I don’t have any kids but I am sure they would love it as well… I plan on giving the minion hat as a gift to some of my friends that I know would enjoy it! Hmmmm what size hook did you use & what type of yarn are you using…??? ?